LED Christmas Cactus with Coyote. Size: 3ft wide by 6ft high. 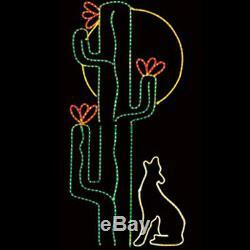 6 foot lighted display cactus; coyote and moon. All weather Powder Coated frame. 55.8 watts; 0.391 amps. The item "6 ft LED Cactus with Coyote Christmas Rope Light Outdoor Display Decoration NEW" is in sale since Wednesday, December 6, 2017. This item is in the category "Home & Garden\Holiday & Seasonal Décor\Christmas & Winter\Lights". The seller is "premiumchristmaslights" and is located in Saegertown, Pennsylvania.